Braxton Comer was born in Spring Hill, Barbour, on 7th November, 1848. After graduating from the University of Alabama and the University of Georgia, Comer became a banker. Comer invested in several different businesses including a cotton plantation and a textile factory. In 1890 he moved to Birmingham, Alabama and served as president of the Railroad Commission of Alabama (1905-06). 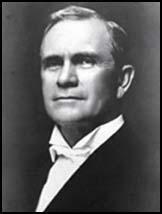 Comer, a member of the Democratic Party, was elected as governor of Alabama in 1907. The following year, the trade union leader, Mary Mother Jones, wrote an article in the socialist journal, Appeal to Reason, that revealed that Comer was illegally employing young children in his textile factories. After retiring as governor in 1911, Comer concentrated on his business interests. However, he did serve for a short time in the United States Senate (March, 1920 to November, 1920). Braxton Comer died in Birmingham on 15th August, 1927.